028 How to Solve Behavior Problems in Your Dog/Cat Household and Preventing Your Puppy From Becoming a Food Guarder. You can teach your dog not to food guard around you. It’s best to start this training at puppyhood, however, you can still do the food bowl exercises I’ll explain with adult dogs. How do cats and dogs misunderstand each other which leads to all that infamous fighting? Certified animal behavior consultant Amy Shojai, author of ComPETability, Solving Behavior Problems in Your Cat-Dog Household joins me to explain why dogs and cats get into conflict and then tells you what to do to stop your dog from mercilessly chasing your cat. 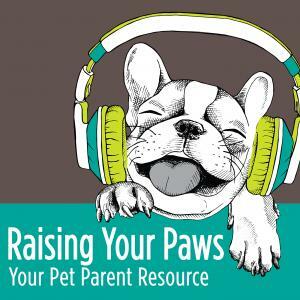 See the Raising Your Paws blog that matches episode 28 for additional information about dogs with existing food guarding problems.- www.raisingyourpaws.com.